Fractional odds, also known as UK Odds are most often used in the United Kingdom and Ireland. Originally used in horse racing, fractional odds are one of the oldest forms of odds for sports gamblers. If you were to walk down London’s high street of bookmakers, you would see fractional odds adorning the walls of some the largest bookies in the world. Fractional odds are extremely simple to calculate because well, they are given in fraction form. The denominator or 2nd number to the right is the amount bet and the numerator or 1st number on the left is the amount that your wager will yield. Let’s say you wager on Liverpool at 10 to 15 fractional odds. For every $150 wagered, your potential net profit would be $100. If you win, your original stake will also be returned to you, leaving you with $250 ($150 original wager + $100 profit) and a net of result of plus $100. Let’s look at wagering on an underdog or high odds bet, where the odds are more in your favor. Say you are placing a wager Newcastle United, the underdog at five-to-one fractional odds, if you were to bet $100 your potential return would be $600, a $500 profit and your original bet of $100 would be returned to you. If you are wagering on an event where there is a definitive favorite and underdog, the odds of the favorite is often referred to as the “odds on” and the odds of the underdog as the “odds against.” If a bet is even money, the odds are not one-to-one due to the bookmaker’s juice or commission. In most cases, the odds will be 10 to 11, where the bettor risks $110 to win $100. The juice or commission on each bet here is fractional odds of 10 to 11, so you would need to wager 110 to win 100. An easy way to convert fractional odds to decimal odds is to convert the fraction into decimal form and then add a 1. For example, 5/1 or five-to-one fractional odds would be 6.00 in decimal odds. 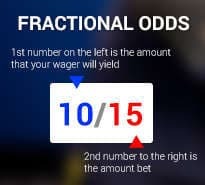 Understanding fractional odds is especially important to UK bettors, but even those not normally using these odds can benefit from understanding them. Used by the world’s largest bookmakers, there is no doubt fractional odds are one of the preferred odds for sports bettors across the world.